It’s the little things in life … and in baseball. So many times it’s those things that make dreams come true. It’s eating right, and training smart. It’s giving up summers to play travel ball, and weekends to learn from the week’s mistakes. It’s taking good at bats, and making routine plays. It’s setting goals, and achieving them. It’s all about the little things. And, sometimes, the little guys. In May, the Quad City Times newspaper featured the “Little Guy Coorporation” – the brain-child of a handful of 2011 Johnson City Cardinals out to prove that baseball isn’t about size or stature, but about skill. Here at Aaron Miles’ Fastball, we call it “scrap.” And it’s those players who steal our attention and capture our hearts. 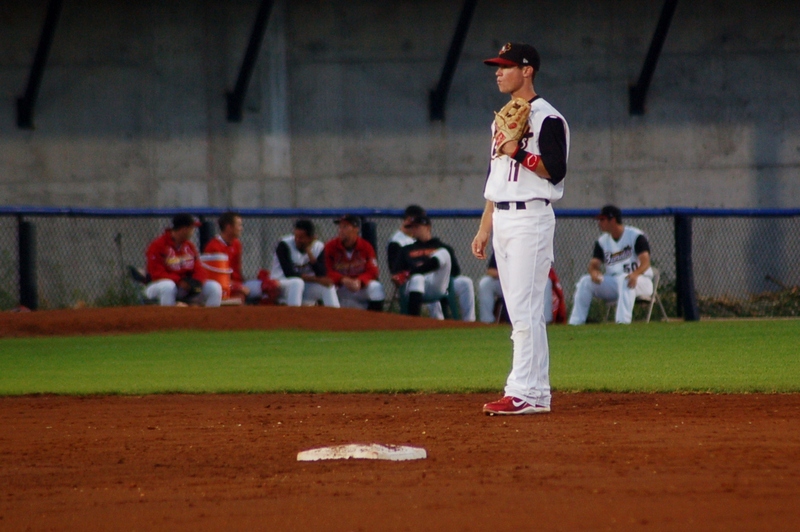 So, it’s only natural that we track down Matt Williams — one of the founding fathers of the LGC – who has made “little” look pretty big for the River Bandits this season. Life as an athlete is all Williams has known. From basketball and football, to golf and even soccer, he tried it all. And, of course, there was baseball. First, it was tossing a ball around in the house and practicing hitting in the backyard with Dad. But before long, it was little league. Then traveling teams, high school, and, well, you know the drill. “Ever since I can remember I had a ball and bat and a glove in my hands,” Williams said. Even so, it wasn’t like baseball was a standout, at least not to begin with. In middle school, Williams was a pitcher. But when arm trouble crept into the picture, it was time for a position change. Still, time at both short stop and second base paved the way for more travel ball. And, in high school, Williams got his first taste of what the future could hold. The first step, three years at Liberty University. 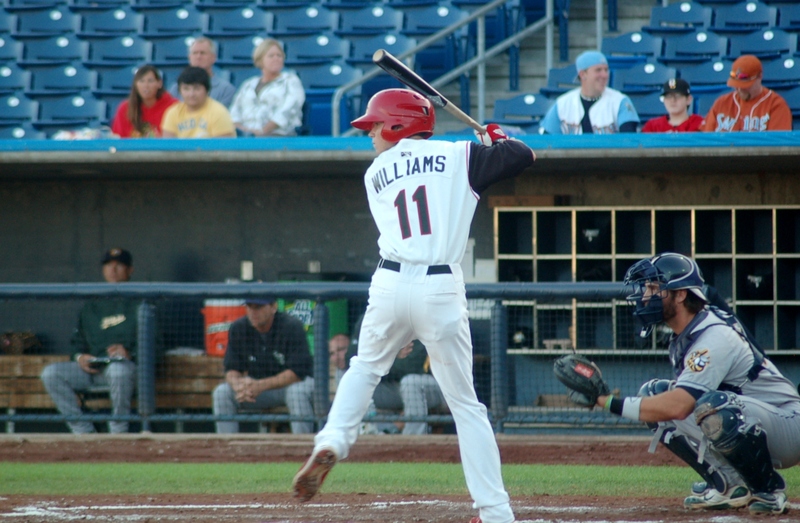 In his junior season, Williams posted a .336 average, with 38 RBI and 41 runs scored. He also led the team with 76 hits, 17 doubles and 9 home runs. Two of those home runs, however, stand out a bit more than the rest. The biggest changes, though, were yet to come, thanks to being selected in the 15th round by the Cardinals in 2011’s June Draft. Transitioning from a high school season plus summer ball to a college season was one thing. But making the jump from college ball, to short-season ball (where Williams and his Johnson City teammates won the Appalachian League title in 2011) and then on to a full-season team presented a new learning curve. “I think the biggest challenge is just trying to stay in the lineup every day, keep your body healthy throughout this long season, and make sure you’re doing the right things off the field to put yourself in a good position to stay healthy on the field,” Williams said. That is something he has done exceptionally well. Williams is second only to Nick Martini in the number of games played for the Bandits this season – 112, to be exact. Martini has played 113. Williams also leads the team in hits (131), runs scored (77), and stolen bases (19). The little things; the scrappy things. Sometimes, those little things can be solely for the purpose of fun. Things like Twitter, for example. Fans like the little things, too. Those little things add up fast. Never count them out. They make dreams come true. Tara is a St. Louis Cardinals reporter for Aaron Miles’ Fastball and a contributor to Around the Horn. Follow her on Twitter @tarawellman. This entry was posted in General Cardinals by Tara Wellman. Bookmark the permalink.